Lang Axel Nut Socket 90mm 8 Point is designed for use with a torque wrench when servicing truck wheel bearing lock nuts. Lang Axel Nut Socket 90mm 8 Point is not to be used with pneumatic power tools. Lang 14 Piece Axle Nut Display includes rack, header and one of each: 6-Point Sockets: 2-3/8'', 3'', 3-1/4'', 3-1/2'', 4'', 4-1/8'', 2-1/4'', 2-1/2'', 2-5/8'', 2-3/4'', 2-9/16'', 8-Point Sockets: 3-1/4'', 3-3/4'', 3-13/16''. 7-Piece Axle Nut Socket Kit. Seven of the most popular wheel bearing locknut sockets for late-modle Ford, Dodge and Toyota trucks. Removes and install hex nuts on trucks. Lang Axle Nut Socket 2 3/32'' 6 Point. Designed for use with a torque wrench When Servicing truck wheel bearing lock nuts. 3/4'' square drive. Lang Axle Nut Socket 2 3/8'' 6 Point. Designed for use with a torque wrench When Servicing truck wheel bearing lock nuts. 3/4'' square drive. Lang 2 3/8'' Hex Locknut Socket. For 1984-95 Ford Ranger, Bronco II and Explorer with automatic locking hubs. Lang Axel Nut Socket 2 3/8'' 8 Point. Designed for use with a torque wrench When Servicing truck wheel bearing lock nuts. 3/4'' square drive. Lang Axle Nut Socket 2 9/16'' 6 Point. Designed for use with a torque wrench When Servicing truck wheel bearing lock nuts. 3/4'' square drive. Lang Axel Nut Socket 2 9/19'' 8 Point. Designed for use with a torque wrench When Servicing truck wheel bearing lock nuts. 3/4'' square drive. Lang Axle Nut Socket 3'' 6 Point. Designed for use with a torque wrench When Servicing truck wheel bearing lock nuts. 3/4'' square drive. Lang Axel Nut Socket 3'' 8 Point. Designed for use with a torque wrench When Servicing truck wheel bearing lock nuts. 3/4'' square drive. Lang Axle Nut Socket 3 1/4'' 6 Point. Designed for use with a torque wrench When Servicing truck wheel bearing lock nuts. 3/4'' square drive. Lang Axel Nut Socket 3 1/4'' 8 Point. Designed for use with a torque wrench When Servicing truck wheel bearing lock nuts. 3/4'' square drive. Lang Axle Nut Socket 3 1/2'' 6 Point. Designed for use with a torque wrench When Servicing truck wheel bearing lock nuts. 3/4'' square drive. Lang Axel Nut Socket 3 1/2'' 8 Point. Designed for use with a torque wrench When Servicing truck wheel bearing lock nuts. 3/4'' square drive. Lang Axle Nut Socket 3 7/8'' 6 Point. Designed for use with a torque wrench When Servicing truck wheel bearing lock nuts. 3/4'' square drive. Lang Axel Nut Socket 3 7/8'' 8 Point. Designed for use with a torque wrench When Servicing truck wheel bearing lock nuts. 3/4'' square drive. Lang Axle Nut Socket 4'' 6 Point. Designed for use with a torque wrench When Servicing truck wheel bearing lock nuts. 3/4'' square drive. Lang Axle Nut Socket 4 1/8'' 6 Point. Designed for use with a torque wrench When Servicing truck wheel bearing lock nuts. 3/4'' square drive. Lang Axle Nut Socket 4 3/8'' 6 Point. Designed for use with a torque wrench When Servicing truck wheel bearing lock nuts. 3/4'' square drive. Lang Axel Nut Socket 4 3/8'' 8 Point. Designed for use with a torque wrench When Servicing truck wheel bearing lock nuts. 3/4'' square drive. Lang Axle Nut Socket 4 7/8'' 6 Point. Designed for use with a torque wrench When Servicing truck wheel bearing lock nuts. 3/4'' square drive. Lang Axel Nut Socket 4 7-8'' 8 Point. Designed for use with a torque wrench When Servicing truck wheel bearing lock nuts. 3/4'' square drive. Lang Axle Nut Socket 2 1/4'' 6 Point. Designed for use with a torque wrench When Servicing truck wheel bearing lock nuts. 3/4'' square drive. Lang 2 1/2'' Hex Locknut Socket. Fits hex nuts found on rear axles and various front axles on light-duty trucks. Lang Axle Nut Socket 2 1/2'' 6 Point. Designed for use with a torque wrench When Servicing truck wheel bearing lock nuts. 3/4'' square drive. Lang Axle Nut Socket 2 5/8'' 6 Point. Designed for use with a torque wrench When Servicing truck wheel bearing lock nuts. 3/4'' square drive. Lang Axle Nut Socket 2 3/4'' 6 Point. Designed for use with a torque wrench When Servicing truck wheel bearing lock nuts. 3/4'' square drive. Lang Axel Nut Socket 2 3/4'' 8 Point. Designed for use with a torque wrench When Servicing truck wheel bearing lock nuts. 3/4'' square drive. 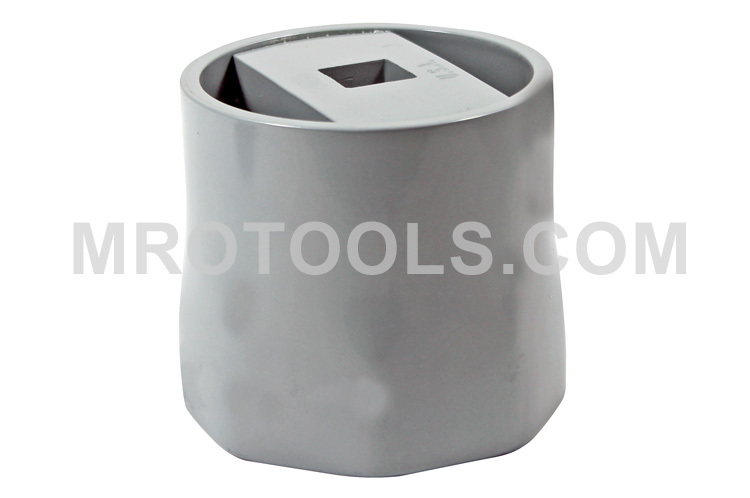 The 1257 Lang 90mm Axle Nut Socket, 8 Point is one of thousands of quality tooling products available from MRO Tools. Please browse Lang Automotive Axle Nut Sockets for tools similar to the 1257 Lang 90mm Axle Nut Socket, 8 Point. 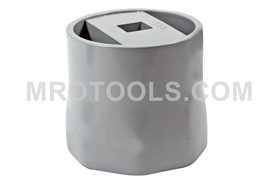 1257 Lang 90mm Axle Nut Socket, 8 Point description summary: Lang Axel Nut Socket 90mm 8 Point. Designed for use with a torque wrench When Servicing truck wheel bearing lock nuts. 3/4'' square drive. Quantity discounts may be available for the 1257 Lang 90mm Axle Nut Socket, 8 Point. Please contact MRO Tools for details.